Am I the only one to be a little impressed that NBC’s four major Thursday night sitcoms all feature Indian-American actors? 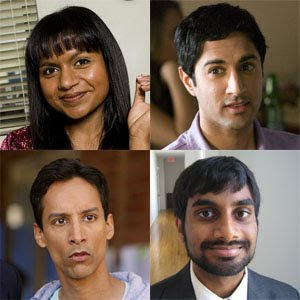 Think about it: There’s Mindy Kaling on The Office, Maulik Pancholy on 30 Rock, Aziz Asnari on Parks & Recreation, and Danny Pudi on the brand-new Community. Should I be impressed? Should I have even noticed? Should I consider these actors’ newfound fame a sign that the racial make-up of the people on major network primetime television is ever so slightly beginning to mirror the diversity of TV audiences? I tried to think of other Indian-American actors who appeared in shows or movies that left an appreciable impact on American popular culture. Sendhil Ramamurthy (who plays Mohinder on Heroes), Ajay Naidu (Samir Not-Gonna-Work-Here Anymore from Office Space), M. Night Shyamalan (who just writes himself into bit parts in the movies he directs) and the actress who played the waitress at Café Nervosa on Fraiser. (That might sound like a joke, but it’s not. Luck Hari may be only credited with 11 appearances on IMDb, but I could swear she appeared in the background of nearly scene set in the coffeehouse. The credits might just be her speaking parts.) Now, the line-up formerly known as Must See TV is once again something that people seem to enjoy and actively watch, and it features these four actors of Indian descent — Asian-Americans, technically speaking, but something other than the Chinese-, Japanese-, or Korean-Americans that I think most people would think of when they hear the term. It may not be surprising to some, I guess. Wikipedia says that as of 2007, 2,570,000 Indian-Americans — or Asian Indians, which some use to avoid confusion with American Indians — currently live in the U.S. That’s less than one percent of the total U.S. population, but that’s apparently still enough to get increased representation on at least one network, on one night. It’s also worth noting, perhaps, that only one of the four shows I’m talking about, 30 Rock, takes place in the kind of big city where a diverse cast would be more expected. (Is Scranton, Pennsylvania, considered a big city? Is The Office’s version of it a big city?) The fictional settings of Parks & Recreation and Community — Pawnee, Indiana, and Greendale, Colorado — both seem like nondescript, mid-sized, American towns. Even better than just being on these shows, the characters aren’t tired stereotypes. They’re not immigrants. They don’t run mini-marts or drive taxis. They don’t forbid their daughters to play soccer. Within my lifetime the vast majority of Asian and Asian-American characters on sitcoms not only enforced one stereotype or another — and often seemed to exist for no other apparent reason. Remember Babu Bhatt on Seinfeld? His character can basically be summed up as “naïve immigrant” and then “angry immigrant. (Worse: He’s from Pakistan, but his name is Indian. And the guy who played him is neither Indian or Pakistani. And Seinfeld was a good show.) It would appear that this is less often the case now. On 30 Rock, for example, Jonathan’s ethnicity has never been mentioned, aside from the fact that Jack Donaghy mistook him for M. Night Shyamalan when they first met. Jonathan’s role on the show — that of Jack’s Smithers — could have been played just as easily by an actor by any other race. This is mostly true for Kelly Kapoor as well, save for the one Diwali-centric episode of The Office and the fact that occasionally finds herself on the receiving end of remarks that are either insulting to or ignorant of Indian people and their culture. Really, that’s how the character debuts — on the “Diversity Day” episode, with Michael Scott speaking to her in what he thinks an Indian accent might sound like and asking her to “try my googi googi.” But these jokes aren’t really at the heart of the character. What makes Kelly so entertaining is the fact that she’s a total idiot. In fact, she herself doesn’t really understand Indian culture and doesn’t seem to care to. In light of the fact that the stereotypical Indian-American employee character would be smart, accented and possibly dressed in traditional Indian style, Kelly being airheaded, hyper-Americanized and more obsessed with celebrity gossip and boys than anything else is actually kind of cool. She’s a stereotype-breaker. Someone casually watching Parks & Recreation’s first season might think that the role of Tom had been written and then given to Asnari in an act of colorblind casting. But I don’t think that’s the case, since Ansari was the first person attached to what was called Untitled Amy Poehler Project or Amy Poehler: Beyond Thunderdome aside from Poehler herself. If anything, Ansari probably had some say in who’d he be playing and what he’d be like. If it was planned from the beginning that Tom was going to be this guy that purposefully tries to distance himself from Indian culture, that makes it all a lot more interesting. Again, maybe this isn’t as significant and I’m treating it, but I feel like it’s worth noting, if for no other reason than that five years ago I wouldn’t have imagined as many Indian-American actors on so major shows. It just doesn’t seme like it could have happened. I don’t know what changed, but I’m glad it did. SIDENOTE: Not technically on the same subject, but related enough. I also wouldn’t have guessed that Saturday Night Live — which, up until last week, had an extra half-hour edition on Thursdays — would feature an Iranian-born performer, if only because there are relatively few Persian actors in Hollywood much less many in the sketch comedy circuit. My guess about Nasim Pedrad: She’ll be the new Maya Rudolph — the female utility castmember who can play women of just about any ethnicity. She’s already been Charlene Yi, Kathy Griffin and Genevieve Waite. Just the fact that SNL could make use of such a person could easily be another indicator of slowly changing American culture, as there are now enough non-white women of note that sketch comedy needs to make fun of them.